It may sound complex, but this soup can be ready in 30 minutes. Tender meatballs that melt in your mouth are beloved both by children and adults. They are the perfect base for this light, but sustaining soup. Meat has always been a luxury product, so housewives traditionally tried to stretch it as far as possible. Mincing meat was a way to get more use out of lower-quality cuts, and cutlets and meatballs were developed as important additions to the table. As time passed, however, meatballs became a dish of their own. Meatballs are practically a national dish in many countries: in Sweden they are served with potatoes and cranberry sauce; in Germany, Koenigsberg meatballs made from pork with white sauce are beloved. In the Middle East, meatballs (known as kofta) are served with raw onion and pita. In the United States, meatballs are often fried and served with French fries — or with tomato sauce on a mountain of spaghetti. There is practically no end as to what can be done with meatballs. They can be steamed, roasted or boiled; they can be stuffed with herbs, nuts and spices. In Russia, meatballs are added mostly to soup. They are made from meat, of course, but also from fish or poultry. Often different kinds of meat are combined to change the flavor — this recipe, for example, involves meatballs made from beef and pork. Meatballs will be jucier if you add chopped onion and herbs to the minced meat. The meat should also be mixed well with salt and pepper and other spices to taste. 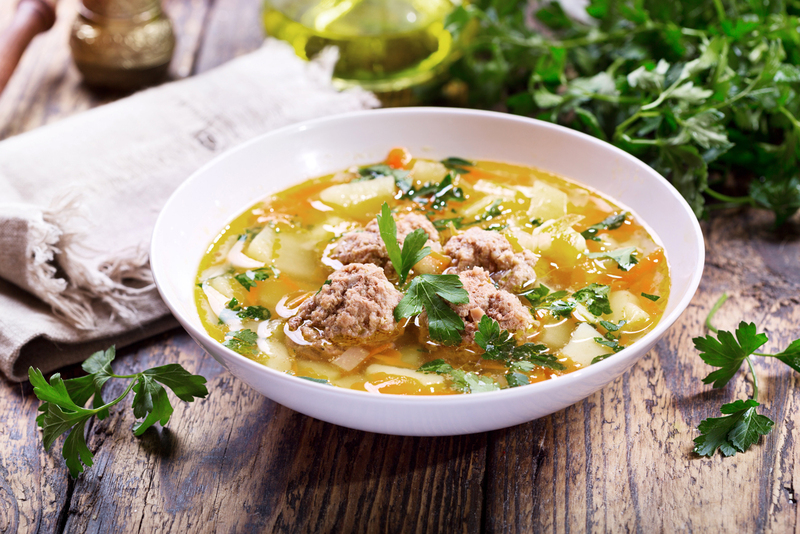 This soup is fairly low in calories, but the protein in the meatballs makes it filling. 1. Chop the meat, mince it twice. During the second mincing, add herbs and onion to the meat. Do not throw away the stems of the herbs. Add a raw egg to the minced meat and mix well. Add salt and pepper to taste. Put in the refrigerator for a few minutes. 2. Boil water. Cut the potatoes, put into the water. 3. While potatoes are boiling, chop the onion, grate the carrot and fry both in a pan with a drop of oil. Add to the potatoes. 4. Form the meatballs from the minced meat mixture and add it to the potatoes, carrot and onion. 5. Tie the stems of the herbs with a thread and put into the water. Although you can skip this step, it adds flavor and character to the soup. 6. Add salt and pepper to taste. Boil for 15 more minutes. 7. Remove the stems and let sit, covered, for five minutes. 8. Divide the soup between bowls and serve with sour cream and more herbs.